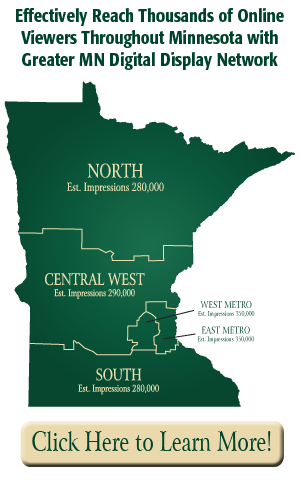 Advertising in the state-wide Minnesota 2×2 Display Network is inexpensive, convenient, and has consistently obtained great results for our clients. 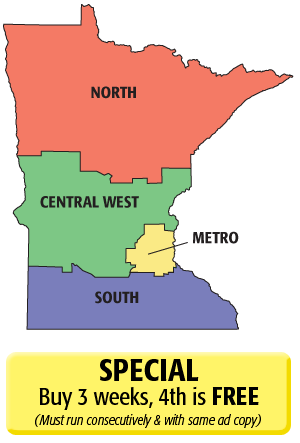 Your ad runs once each week in more than 280 local newspapers throughout Minnesota, ranging in size from several dailies to small-town weeklies, and located geographically in every part of the state. The new 2×8 size is now available! This gives plenty of space to present a message, explain benefits, or list multiple contact points. 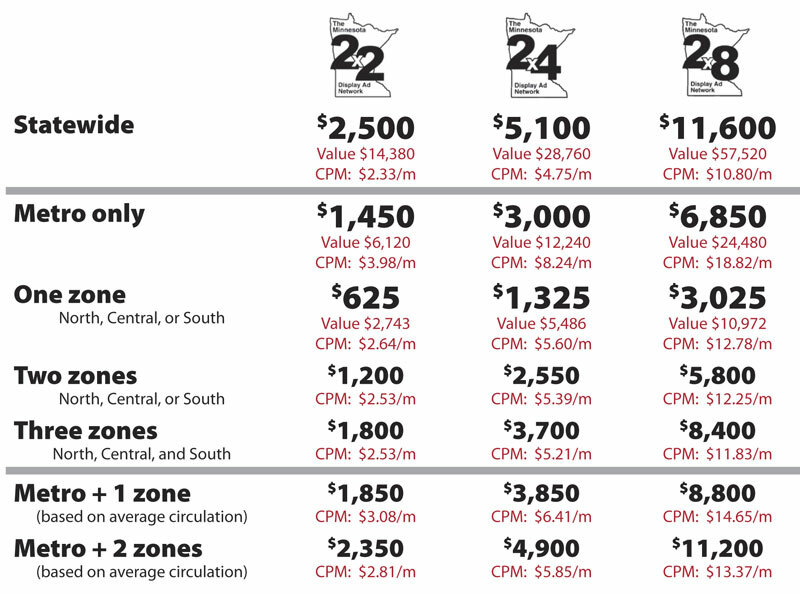 Compare the value to price: a statewide 2×8 ad place in each paper individually would cost $57,520 instead of $11,600. Check out the one-zone option also, which is only $3,025 for a $10,972 value. As with all sizes, a limited number of spots are available each week in this program, so book early to guarantee your position. There are also regional options if your target area is only a portion of the state. There are a limited number of ad spaces available each week, so reserve early for specific dates. Deadline: Tuesday mornings at 10:30. Pricing is listed above. If you were to place a 2×2 ad in each participating newspaper individually, the cost would be more than $14,380. However, coordinated through this program of the Minnesota Newspaper Association (MNA), each paper allows a huge discount for a limited number of ads to make this opportunity available. Simply place one order with us and your ad is routed through the system into all the participating newspapers. Deadline is Tuesday morning at 10:30 (earlier near major holidays), and each paper runs the ad in its next available edition. One payment takes care of everything. If you desire, a single tearsheet and affidavit stating proof of publication is provided by MNA. Our clients keep coming back because this program has proven results with effective ads. Local newspapers still have a greater “reach” than any other media, so approaching people through their hometown newspaper with content they are interested in only makes sense. Not only that, but nothing else can come close to the cost per view on this scale — at the industry average of 2.3 readers per copy, that comes out to less than three-quarters of a cent per view! Ask any marketing professional if he/she likes those numbers. As with any advertising, consistency improves performance, so ordering a statewide 2×2 ad schedule along with a major ad campaign increases the effectiveness of both.